Hello and welcome, faithful, to a glance over the Protectorate of Menoth stats for the World Team Championship this year! WTC stats are always pretty interesting, in that it's the largest singular drop of open stats available to us in a single event. With over three hundred entries, it's a pretty interesting look at the state of the game as a whole. That said, there's an important caveat; this is a team event, meaning many submissions are designed around the concept of the team matchup process. While there is *some* information to be gleaned that applies to the regular game as a whole, it definitely needs to always be considered that this is not a typical Steamroller style event. With that out of the way, though, let's have a look at the Faithful this year! Overall, it's clear we have two kings (queens...king/queen?) of the castle in Harbinger and High Reclaimer. Harbinger is unsurprising; she was already starting to see a major resurgence in competitive play prior to the Exemplar CID, and her buffs in that cycle were a massive deal. High Reclaimer may be slightly more of a surprise to some, but he has always been a pretty strong choice. In this case, we had a major set of buffs to the theme he likes the most in Exemplar Interdiction, as well as a change to the Judicator. The Judicator change is quite significant for him; by design, High Reclaimer has loved colossals. He has very little focus to allocate most of the time, and a colossal represents the highest output-per-focus you can get out of a single 'jack. Further, the Judicator's new Reliquary stacks with Hand of Fate to basically take dice math and chuck it out the window as far as what the colossal is capable of, in addition to a bump to speed helping him out immensely. This has put HR in a spot to make a huge resurgence in the meta, and we're seeing the aftermath of that here. Amon has fallen far, but this isn't really a case of him losing anything. In fact, buffs to models like the Indictor I think are amazing for him. However, we just... have a couple other really strong options now. Part of me also wonders if, with the option of other things being available... people are just a bit bored with him, given that he's been the 'best' caster in faction for most of the edition. Seeing Thyra relatively high on our list (very relatively, we're into the 4 or less casters here) warms my heart a bit, as I think she's one of the strongest options we have with her ridiculously deep box of tools. I think her spot, given the power level of those above her, is appropriate though. Cyrenia is very cool to see! It's hard to say what she's going to look like as far as her end stats, but Cyrenia is a very solid generalist with a good toolkit who I think can be kind of dropped into anything, barring certain skews. This gives her a good spot in team formats where it's good to have stuff that can cast a pretty wide net. The rest are mostly one-offs, but I can talk a bit about what we didn't see. Kreoss2 has a single entry, which is a bit sad because I think he's much more interesting right now than he's getting credit for. My experience with him has been that he's quite punishing, and Sacrosanct in particular screws with a lot of things that are of a concern for us (gotta love Commandos falling over before they quick work/long gunners falling over before their second shot...) but... he doesn't pair well with Harbinger in my experience, and Harby is probably a bit stronger, so she wins out. Reznik2 is also seeing very little play. Reznik2 I've always liked in team formats because he can skew into certain matchups in a really vicious way; it's common for him to force Haley3 players into their off-list by design, as well as screwing with a ton of hordes. Still, again, we have two real power players here right now so he just doesn't quite win out. Regarding themes, the breakdown is again, pretty unsurprising. Exemplar Interdiction and Faithful Masses take the top spots, and given that they're our best two themes, and work best with the two casters at the top of our popularity list, seemed reasonable they'd be the two most popular. Creator's Might is populated almost entirely by Amon's submissions; I consider it our worst theme personally, but... it's also a necessary theme and casters like Amon make it work great, so... unsurprising to see it where it is. Guardians of the Temple has only a single submission, which is also not a big surprise. Guardians is a strong theme, but doesn't quite keep up with FM and EI... personally I think it just needs new releases someday and it'll enter contention alongside our other two troop themes. I did a run through the lists to work out themes for the top casters used. 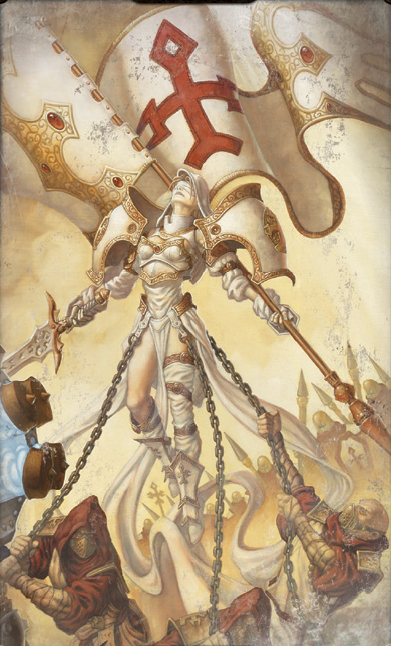 Harbinger is used in Faithful Masses 12 times, with four Exemplar Interdiction lists. She works very well in FM as well as EI, but FM I think is her home so this is what I would expect. Continuing with what you would expect, High Reclaimer has 12 Exemplar Interdiction lists, a single Faithful Masses, and one Creator's Might. Two of these lists are running double Judicator with him, but do so in different themes. Now we've got the full breakdown of every model used! Choir being the top is unsurprising, since they're in everything. Dervishes remain near the top of the pack, alongside Wracks who... again, are in everything. The Masses lists lean towards a pretty similar formula of 1-2 units of Idrians, double Champions of the Wall, double Allegiants, which means those three pieces sit near the top. Exemplar Interdiction, though it was slightly more prevalent, has a bit more of a mix of what it's running so its pieces drop slightly lower in individual popularity. A fun thing to see here is 22 Judicators at the event. The buff to that colossal was seriously huge, and it has become a real power house choice. Sadly, there are no Revelators but... the Revelator has a specific use over the Judicator in its support aspects of removing stealth and a bit of board control, and if you don't need those... you're going to pick a Judicator right now. Forgeguard are our most popular merc unit, with only Aiyana and Holt competing for the spot, with 6 max and 3 min units. There are three Aiyana and Holt units, and if you add those up you get... 12! Which is how many Attendant Priests there are. Then we have a scattering of models that are either niche or were only used in one place; the Guardians of the Temple models, the Avatar, Taryn, etc. I always like to check through and find some of the 'weirder' or more generally unique lists. The first one of note is Australia Wobbegong's Pete Leblom, who is running Harbinger Exemplar Interdiction with max FA of Exemplar Bastions and a unit of Cinerators. This style of list was talked about a lot in the CID, and I think it will be really exciting to see how that one plays out, especially in a team format where you can try and push it into matchups it wants to see. The next one that caught my eye is Michael from Switzerland Dairy Products who is running an Amon build with... a Castigator, Dervish, Devout, Indictor, Reckoner, Revenger, Templar, and Vigilant as his battlegroup. This mostly just caught my eye because the battlegroup seems a bit random, curious what he's going for there, but it was just kind of funny when I noticed it. Richard Would from Ireland and Mike Puryear from the United States are running the two High Reclaimer double Judicator builds present, but took them in very different directions. Richard is running Creator's Might, with Sevvy0 running the cheapest 'jack available to him, a dervish. Puryear, however, went the direction of Exemplar Interdiction, giving the build a unit of errants as well as giving the Judicators Blessed weapons which is phenomenal. Sevvy0 also takes command of one of the Judicators personally, which is a risky move but... he can hang further back than pretty much any other junior, especially when you're relying on guns. Stay faithful, Menites! See you next time!